Found only in Paul’s letters to Timothy, Hymenaeus is an example of a man who once had been enlightened of the truth, tasted the heavenly gift and shared in the partaking of the Holy Spirit and yet found himself shipwreck concerning the faith. It is tragic to witness the shipwreck of ones faith when; for many years an example of fidelity is shown. Much like a ship sailing the oceans with its tall mast and canvas filled with wind, gliding across the waves with the grace of its maker – a person’s life is summed up in the same figure. We sail the wide seas of life being guided by the direction of our helmsman Jesus Christ. It is the trust and faith we have in him that allows our lives to be direction by His will. Hymenaeus and Alexander enjoyed this blessing for time. For reasons we are not told, they rejected Jesus Christ as their guide and began to take control of their own lives. In a figure they threw the Lord “overboard” and took control of their own lives, steering as they willed. Sadly, without the guidance of the Lord, the ship wrecked on the shoals of falsehood, deceit and broke apart on the rocks of apostasy. How difficult to watch precious souls destroy themselves as they desert the faith of God. Shipwrecks are caused by carelessness and indifference. The seas of life are very treacherous and can only be safely traversed with the Lord at the helm. Jesus knows every obstacle that will be in our path. “For we do not have a high priest who cannot sympathize with our weaknesses, but One who has been tempted in all things as we are, yet without sin” (Hebrews 4:15). Without Him at the helm, our lives will be in shambles. The Lord knows what we need and He knows where we need to go. We look at the horizons of life and are filled with doubt. We worry about what is over the next horizon and how to overcome the coming storms. Our hearts are filled with fear as the storms of life pound upon us and we cry out to the helmsman for relief. If we simply trust in His guidance and His will, we will find safety in the harbor. This lesson shows the danger of listening to the doctrines of men. It is possible to lose one’s faith as seen in Hymenaeus, Alexander and Philetus. 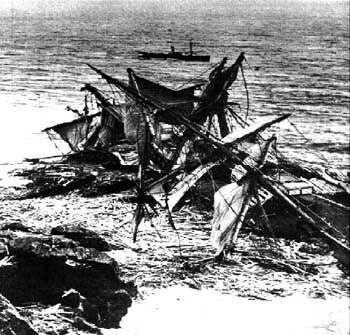 False doctrine will shipwreck the faith of God’s people. Turning to the doctrines of men will cause men to lose their way and lose their soul. They erred concerning the truth and became advocates of falsehood. The clear pattern of apostasy is when Jesus Christ is no longer the one who guides our ship through life. These men had the faith but threw it away. Let not Satan take control of our lives to lead us upon the shores of destruction. Throw him in the sea and implore the Son of God to lead your life in every shifting wind of time. Share not in the evil of Hymenaeus and Alexander.